We’ve officially experienced our first frost! The chill of mid-autumn is upon us, and staying warm will again, becoming a hobby. Next weeks’ First Friday offerings in the area will make the chilly, trek from one destination to another, a part of the fun. Dovetailing off of the popular West Chester expanded art walks, Kennett will host its second November Expanded Art Stroll: Destination Kennett Square. This will begin at 6pm and include the November exhibition at Square Pear Gallery, Dia De Muertos Installation at The Garage Community Youth Center and more. Originally sponsored by Historic Kennett Square, and The Kennett Township, new organization Pop Up Art KSQ will host its first independent Pop Up Art Walk: Contemporary Kennett. Stroll through the charming residential community of Kennett Square, as three residences will be transformed into one night galleries. New music organization (part school, part venue, part podcast location) created by Bryan Tuk, Groove KSQ, will be partnering with Pop Up Art KSQ to host video art by Lisa Marie Patzer as well as live music. Stay tuned for details on this specific site. Contemporary Kennett will begin at 5pm (an hour prior to the Expanded Art Stroll) and will include over fifteen artists in varying stages of their career but all relatively local to Kennett. Pop Up Art KSQ will feature Lindsey Hardey, David Leonard, Andrew Jacob, Julia Jay Hardman, Devon Dadoly, Becky Brakeall, Dan Borkoski, Traction Co., Aubrie Costello, Lisa Marie Patzer, Geoffrey Dubinsky, Racer LeVan, and Caitlin Kelley. This group features video artists, sculptors, painters, photographers, and installation artists. Enjoy a cozy late autumn walk through historic Kennett Square and stick around for the after party which will include drinks, several live music acts, and will be catered by Anna Altieri of Grounded Gatherers. Oh and you can sign up for your Pop Up Art KSQ membership! Stay tuned as the map will be made available on the Pop Up Art KSQ website November 1st. This exhibition celebrates diversity not just of an artistic nature, but of a more universal nature which embodies a beautiful message leading us into the winter holiday season. This exhibition will be on display through January 6th. The 43rd Annual Unionville Art Gala is coming up which, for me, really marks the beginning of the holiday season. This fundraiser features over 50 local artists of varying styles. Walk away with a piece of art, and help raise money for Unionville High Schools’ Education Enrichment Projects. This years featured artist is Frank DePietro. You may recognize his work, as he shows locally (and nationally) and recently participated in an exhibition at Kennett Square’s Square Pear Gallery. 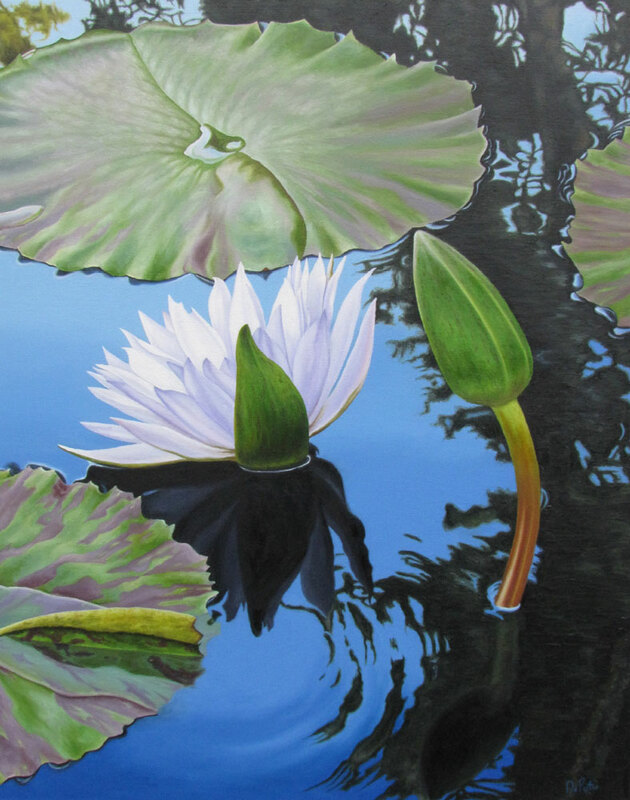 DePietro paints, with such precision, vibrant botanical paintings. Sign up for a silent auction and win some fantastic art at an unbelievably reasonable price. Gala will occur on November 16 6-9pm and November 17 11-4pm at Unionville High School. If you find yourself in Philadelphia this weekend, stop by the Old City Jewish Center for Amie Potsic Art Advisory’s new show, Zelda Edelson: Color in the Moment. Stop by for the reception during the First Friday art walk from 5-9pm. Edelson has created her own unique method of creating her paintings from her walker, She rotates the paintings throughout her process to make them accessible to range of motion, and her rich, bold paintings encompass the energy and confident strokes of the Abstract Expressionists. Admission is free and open to the public. Exhibition runs until November 30th. As always, tune in to Art Watch Radio on WCHE 1520AM from 1-1:30pm. Next week, October 31, join Andrew Snyder, artist & West Chester University Professor as he hosts ceramic artist and teacher Matt Hylick Until next time!